The Wolftone HELIUM is proudly hand built by Malekko in-house in Portland, Oregon using the highest quality components! A brief history of the Wolftone pedals: in the early 2000′s, our friends Studio Electronics released two superb Todd Wolfgram designed effect pedals, the Wolftone HELIUM and Wolftone CHAOS. These pedals have since earned almost mythical status due to their intense distortions and unique sounds which were unlike anything else available as well as their rarity. 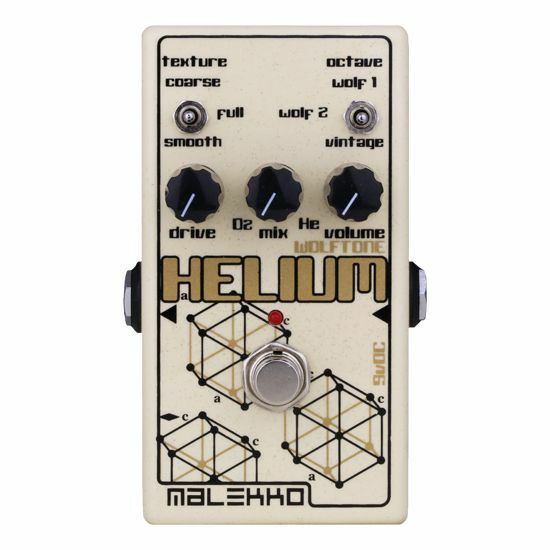 Now, after months of close work with Todd, this updated version of the legendary HELIUM features a second WOLF setting to augment the original pedal’s two position octave sonic palette and has been designed to operate with a ‘standard’ 9v neg tip power supply. 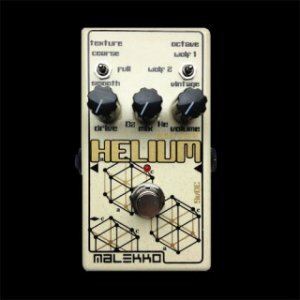 The HELIUM is an Octavia style distortion pedal coupled with an intense octave up effect. Its ‘Texture’ and ‘Octave’ switches will take your sound from a vintage Tychobrae scream to a clear, sweet, singing octave, while the ‘Mix’ control lets you blend your distorted fundamental note into the effect. The interaction of gain to dynamic response work together to make the Helium the most versatile and pivotal “octave up” pedal to date. See below for Todd Wolfgram’s pedal operation description! “I’ve always liked octave pedals, but was always frustrated by them. A great sound, but a bit narrow in terms of range. We’ve all heard these boxes, so let’s start at a familiar place. The sound, especially when the DRIVE is up, is aggressive while at low DRIVE settings the notes tend to sputter, especially when the guitar is backed off. It’s a trade off that’s always been there. The WOLF 1&2 (OCTAVE) modes allow the lowest DRIVE and guitar volume settings to generate octave signals, making this pedal usable for much subtler sounds than could be had before. WOLF 1 is bright… dry and reedy (great for mixing with the fundamental), while WOLF 2 is full like the VINTAGE setting, but still maintaining low-level sensitivity abovementioned. Not as aggressive on the attack (that’s why the VINTAGE mode is there). TEXTURE is a waveshaping control that accentuates or tames the inherent ‘spikiness’ of the generated octave. Combinations of the two switches create a variety of attacks, and when blended with the 02 signal can create a great pseudo-feedback octave shift effect. MIX is just what it seems to be. The fundamental is voiced a bit dark ( this lets the upper octave lay on top of the original rather than clashing with it), but at the minimum setting, the MIX adds just a little extra edge to the lower octave. Likewise, at the highest setting of the MIX, the upper octave gets a bit of extra bite.